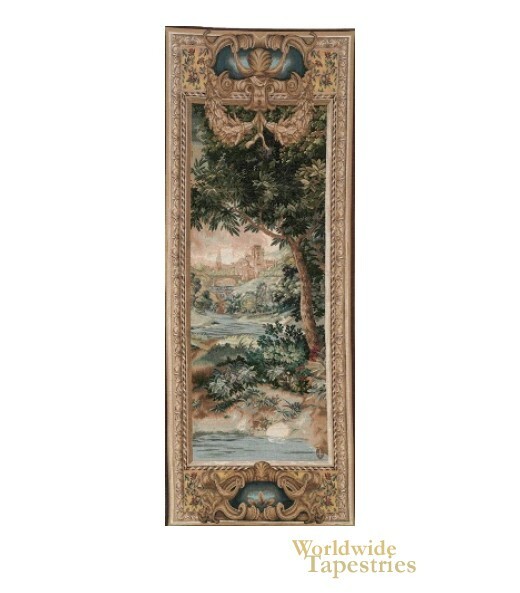 “Portiere Cascade II” tapestry is the perfect mirror of “Portiere Cascade I”. A masterpiece of detail and design, this verdure dates to the 18th century in Lille. While traditional verdures featured the same amazing detail in the foliage, they didn’t have additional elements, such as the French town in the distance that we see in this later verdure. The intricate attention to detail, fine use of vibrant colors and sense of depth in this tapestry are nothing short of magnificent. Perhaps that’s why verdures are so popular, even today. They create a sense of reality that’s almost unparalleled in other genres of art. “Portiere Cascade II” comes with an equally rich border that is finely embellished with flowers, wreaths and other adornments. Portiere Cascade II tapestry is lined and has a tunnel for ease of hanging. Note: Tapestry rod and tassels, where pictured, are not included in the price.